After a visit to Arran's only distillery - established in Lochranza as recently as 1995 - and a generous measure of spirit while there, a day on the hills was called for to clear fuzzy heads. With just a day left of our short break on this island, we decided we had to scale Arran's highest and best-known peak, Goatfell. 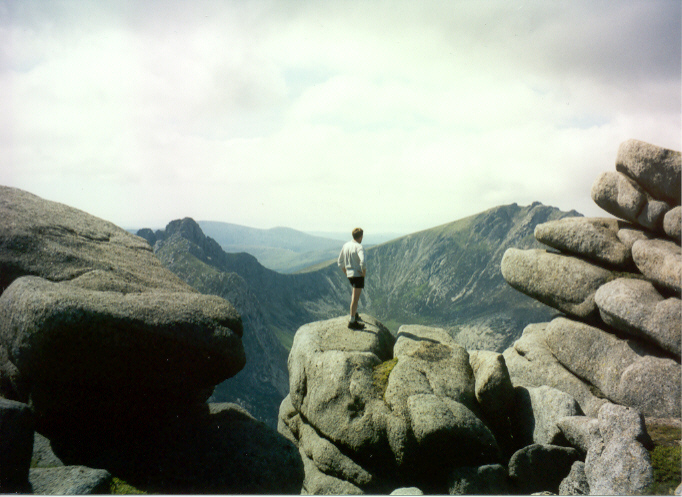 There are a number of approaches to the summit, the most popular ones rising from Brodick. However, we opted to tackle the top from Sannox, six miles north of the island capital. Our start point was a small parking area on the seaward side of the A841, just north of Sannox. The route leaves the road on its west side, next to a white cottage, and sets off up a track, passing through a rather decrepit gate. Following the river upstream, a tall white pole is passed - a beacon to assist with maritime navigation - before the first remnants of the old Glen Sannox mining industry are reached. There's a roofless cottage, the grounds of which are used as a rather pleasant unofficial campsite, and some concrete ruins. Stay with the track as it passes below mine workings and fenced off shaft heads to reach the river where you may have to take shoes and socks off to ford the water. On the other side, the track narrows to become a path, striking up the glen, staying close to the river on the left. The way is wet and muddy in places, increasingly so as you near the top of the glen. Here the water is crossed again - this time as a youthful stream - then a well-constructed path climbs steeply up on to the Saddle. The ascent is hard work and, higher up, a little easy scrambling is called for. We clambered up through a long, narrow and rather steep crack in the rock, but this is an optioned diversion for those looking for a bit of fun. As you emerge on to the col, views open south down Glen Rosa, one of the approach routes to Goatfell from Brodick. 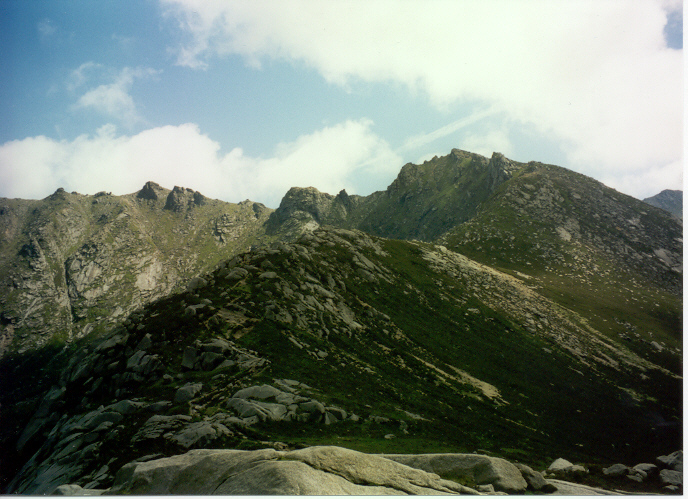 To the west, a steep path rises on to the craggy peak of Cir Mhor. However, we were headed east, up on to North Goatfell. It's an easy walk with a couple of harmless scrambles and it wasn't long before we were perched on the slab of a summit, sharing our crisps with a greedy seagull we christened Harry. At this point, on a clear day, the mainland is visible across the Sound of Bute and the Arran ferry can usually be seen making its crossing. After our short break, we set off south for the top of Goatfell, half a mile away. A well graded ridge - Stacach - links the two peaks. 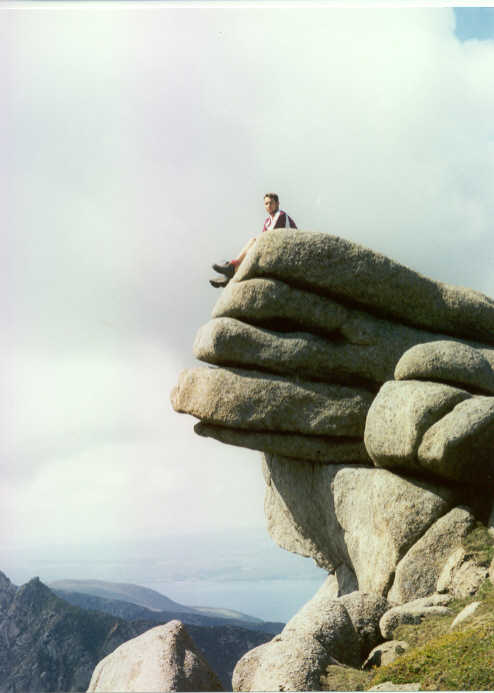 On this section there is the option to scramble over a set of delightful granite tors, the rocky bunions offering a fine array of handholds for those who want to give it a go. Alternatively, a path skirts to the left of the steep mounds, for those who simply want to walk. We scrambled, adding an exciting element to our Arran adventure. Goatfell's trig point sits amid a crazy-paving of slabby rock where Royal Navy crews have carved the names of their vessels into the stone. A viewpoint indicator leads the eye to surrounding landmarks, including the north-east coast of Ireland which can be seen over the water. Below, Brodick, is visible. Having renewed our acquaintance with Harry (or at least another seagull who resembled him exactly) we retraced our steps north along the ridge towards North Goatfell, but opted to follow the path beneath the summit as we headed for Mullach Buidhe, the top perched on the edge of the crags above Glen Sannox. An obvious path continues north, leading to the crowning glory of the day's expedition, Cioch na h-Oighe. The route out on to this peak involves a relatively easy, but none-the-less exhilarating, scramble along a narrow ridge of rocky teeth. This can be avoided by descending the spur on the south side of Coire na Ciche. The 'teeth' haunted the view ahead as we descended the wide northern slope of Mullach Buidhe. The way narrowed as we embarked upon the first of the rocky tors, picking our way round and over huge boulders of granite. In truth, this section of the walk was not particularly difficult, and there was again the choice of opting to go over the various bumps, or skirt round below them on an obvious path. At points along the ridge it is possible to 'escape' and descend into Glen Sannox, should you decide you've had enough. We continued to the summit of Cioch na h-Oighe at the end of the ridge where the path continues down over the northern shoulder. The descent is steep and there are a couple of tricky points where you have to negotiate a route round or over large slabs of rock. At the bottom, the path strikes north-east over grassland to rejoin the Glen Sannox track below the mine workings. As it had been a particularly hot and sticky day, we jogged back down to the car park, grabbed towels from the boot of the car and took a wonderfully refreshing dip in the sea at Sannox Bay. A perfect end to another perfect day on the hills. Map OS Landranger 1:50,000 sheet 69. Start/parking Layby with public telephone box and toilets just beyond the northern end of Sannox village. GR: NS 016455. Public transport Caledonian MacBrayne operate several sailings a day from Ardrossan to Brodick. A public bus service runs around the island. Grading A route for experienced hillwalkers, with the option of some easy scrambling.